We've all seen it happen. One day, that beautiful stretch of woods – a highlight, maybe, of your morning commute – is mysteriously gone. And a few short weeks later there is a row of houses… or two or three or 10…. Of course, we all need someplace to live. And when it comes to fitting homes onto a piece of land, most developers think that more is better. Devony Lehner and Tom Taffe, owners of Stream Hill Park in Homer, think that there's a better way. And they're out to prove it. Devony has had a long relationship with responsible land-use planning. 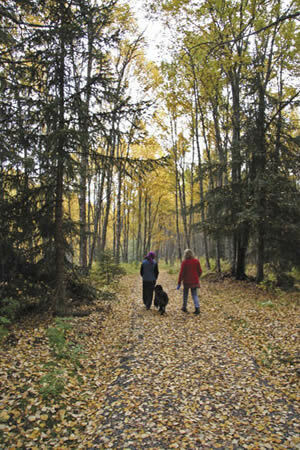 Having worked for the Natural Resource Conservation Service and served on the board of the Homer Soil and Water Conservation District, she knows the arguments that developers make when they design closely packed subdivisions that raze the lot's natural beauty. But while she has always rallied for environmentally low-impact building plans, she had never put herself in the developers' shoes. "A friend of mine once said that if people with environmental values don't do the developing they're not in a position to complain," she recalls. "That was a disconcerting reality." So when she and Tom learned of the 100 acres available for purchase on the east side of town, they decided to put their money where their mouths were. "The best way to make the argument is to lead by example," says Tom. "You can wag your finger all you want but the developers will always say, 'You don't understand what I'm up against. You don't know what it takes to succeed.'" And so began the Spring Hill Park Development – a greenspace project that set out to prove that neighborhoods and nature can live together – beautifully and profitably. 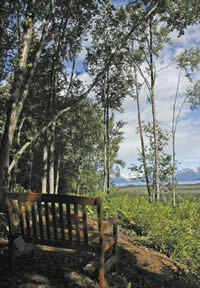 Greenspace development is a fledgling idea here in Alaska that is already taking hold in the Lower 48, says Devony. It's a departure from cookie-cutter neighborhoods with identical lots. "Rather than plopping homes down in rows with no respect for the natural and cultural environment," says Devony, "you look at the land first and figure out what you want to protect." So instead of spreading homes across the entire area, you cluster the homes where they will have the smallest impact on the natural surroundings and then you maximize the remaining acreage for the enjoyment of the entire community. At Spring Hill Park, the home sites are limited to 35 acres and the remainder of the land is made up of parks, gardens, meadows and trails. "We wanted to have as many of the lots open onto the greenspace as possible," says Devony. "Parks are your backyard and your view." Those lots that don't immediately border a park are only one lot away and boast magnificent views of Kachemak Bay, she says, views being a "resource" that you want to protect. To formally protect those views, the Stream Hill Park developers included covenants in their development, restrictions described as "thoughtful" on the project's web site. Devony and Tom have put an extraordinary amount of thought into the shared greenspace. "The landscaping is the most rewarding aspect of the project," says Tom. A beautiful entrance park designed by Homer gardener Brenda Adams of Gardens By Design recently won the prestigious National Merit Award for Garden Design from the Perennial Plant Association. It is so lovely that it's attracting brides and grooms looking for the perfect photo back-drop. A covered bridge leads you to the neighborhood's ever-expanding groomed trail system. A birch forest, a meadow with breath-taking views of the bay, and even a fenced-in dog park with benches for relaxing and visiting are designed to encourage outdoor use and sociability among neighbors. "We wanted to create places where neighbors could enjoy the area in different ways," says Devony, "and also to congregate if they want to." Devony, an avid equestrian, has always utilized the shared trails near her home and believes it nurtures a sense of community. "When you run into your neighbors on the trails, there's a different kind of social dynamic," she says. "It's completely unstructured and organic. People are in a relaxed mood; no one's hosting the interaction. It creates a kind of community bonding that I think is critical. It's a dynamic we need as a society because of the way a lot of development styles tend to isolate people." This interaction isn't merely limited to those living in the development. The greenspace is open to the greater community. And ultimately, the trails will lead to city bike trails so that you can walk or bike downtown in a matter of minutes. "If you make trails and parks easier to get to then they'll see a lot of use," says Devony. "And a lot of people are recognizing that if you live near a trail system it improves your health." "The research shows that this idea is profitable," says Tom. "We discovered that when you do this kind of development, property values increase faster. This is not just idealism. This is practical." Devony thinks that the economic downturn is changing the way people look at houses. "People are looking to set down roots," she says, less likely, perhaps, to expect to "flip" a house quickly. "It makes my job so easy," says Kary Greeley, owner of Homer Seaside Properties, Stream Hill Park's broker. "It outshines any other typical development in town. The special care that went into the planning of the project – it just takes your breath away." She continues, "I really care very much about what I'm selling and I turn down a lot of projects. I'm proud to be associated with it." Careful consideration has also been given to the design of Stone Step Lake and Oceanfront Estates in Homer. "(The developers) took more than 200 acres of land and there are only 38 home sites," notes Greeley, owner and broker. "It's on a 58-acre lake, and there's oceanfront as well as lake front. It has been designed to keep the integrity of the land, and the development has not encroached on any wetlands at all." The park-like setting includes public walking trails that are very horse friendly, she adds. "There's a lot of history in the land, and it's great that someone went in and did the right thing (in developing it responsibly)." The couple is quick to credit the team of people who have helped make the project a success. "We were particularly lucky in our contractor," says Tom: Ray Clapp of Coast Range Construction. "He was in charge of every aspect of the construction of the infrastructure," he says. "When you're doing a project of this size, you want to guard against catastrophic failure as a result of cutting corners. And Ray won't just do what's needed. He anticipates issues and comes up with solutions." "People talk about business like it's a win-lose deal," says Tom. "But good business is win-win. This is a small community in an isolated area, so everyone who's involved has to work together to make our community successful. The way you do business helps define your community." 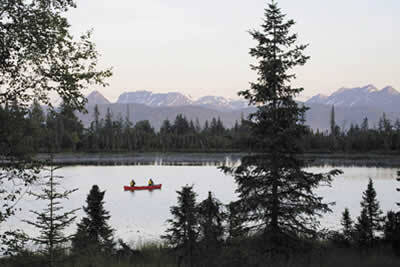 "In Alaska," says Tom, "we have to be stewards of the land – to protect what we all came here for." He finds inspiration in the work of Willie Hensley, the Alaska Native leader who was the architect of the Native Claims Settlement Act. "He felt that it was the land… the place that's important," says Tom. "He said that if we can keep our sense of place, then we can find our soul." Devony agrees that Alaskans, in particular, can have a deep impact on the environment, and, in turn, are deeply impacted by it. "Once you've got these core things started," she says, "it ripples out." "The more you expose people to the things that are good for them – in a physical, emotional, and spiritual way," she says, "the more they can change in good ways."